← Woody the woodpecker, why no concussions? To become a world bathed in oceans of water and habitable, Earth first had to take a beating. A popular hypothesis holds that icy comets and asteroids pummeling early Earth delivered the planet’s water from the icy outer reaches of the solar system. Rocky, terrestrial worlds in other planetary systems might become watery by the same process, but assessing just how much ice is available to distant, newborn planets has been challenging. With the help of the European Space Agency’s Herschel Space Observatory, however, astronomers have gotten a good look at the seeds of a planetary system around a young star 175 light-years away, and there seems to be plenty of water to go around. The researchers used Herschel to scan the protoplanetary disk around the 10-million-year-old star TW Hydrae, one of the nearest such disks available for study. (Protoplanetary disks are the swirling pancakes of dust and gas surrounding young stars that can coalesce over millions of years, as the sun’s disk did, into terrestrial planets and gas giants.) The astronomers reported in the October 21 issue of Science that they picked up a faint signature of water vapor from TW Hydrae’s disk, which they presume emanates from a much larger reservoir. The icy outer portion of the disk probably contains enough water to fill Earth’s oceans thousands of times over, the researchers estimate. Locating faraway reservoirs of water is generally hampered by the abundant water vapor in Earth’s own atmosphere, which clouds the view of ground-based telescopes. That is not a problem for Herschel, a large far-infrared/sub-millimeter–spectrum telescope stationed 1.5 million kilometers from Earth, well beyond the orbit of the moon. From its unobstructed vantage point, Herschel’s spectrometer located a small amount of water vapor coming off of TW Hydrae’s dusty protoplanetary disk at a distance of roughly 100 astronomical units, or 100 times the Earth–sun distance, from the star. The very presence of vapor so far from TW Hydrae points to an interaction between the star’s radiation and the ice in the disk. “We know that at these distances the temperature is so low that it should be frozen,” says lead study author Michiel Hogerheijde, an astronomer at Leiden Observatory in the Netherlands. 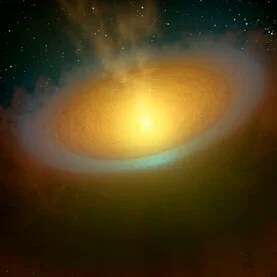 But ultraviolet (UV) radiation emanating from TW Hydrae should liberate some water molecules from icy dust grains in the protoplanetary disk, in a process known as photodesorption. With a relatively clear look at one planetary system to compare with our own, astronomers can now more confidently ponder the existence of distant, watery worlds. For if TW Hydrae develops rocky worlds, there should be plenty of icy leftovers on the outskirts of the planetary system to supply those worlds with water, in much the same way that comets and asteroids may have provided for Earth billions of years ago. “If the mechanism that delivered Earth’s oceans happened here, it may be happening in other solar systems as well,” Hogerheijde says. So my title this time is a pretty strong one, where does the water on our planet come from? That’s a big, very big question, yet a totally fundamental one too, what the physics research people call, a serious query. Here I am studying cerebral concussions, so what does water have to do with getting ‘bonked on your noggin’? Pretty much everything I would say. First off, our bodies are practically all water, our blood has the same component ratio as from ancient oceans. Our brain sits in a pool of water-like fluid, cerebral spinal fluid, (CSF). My last post on the woodpecker blog concludes- these head hitting birds don’t get concussions because they have minimal CSF surrounding their brains, so water has a lot to do with the motion of the brain during a concussion. One of the guiding books in my own little library was found earlier this year during my sabbatical search. The book is titled Sensitive Chaos by Theodor Schwenk. I still get goose bumps when I flick open the book. Its spoken passages are lyrically magical describing the movement of water in a majestic, sweeping fashion as if from a book of poetry. I get enormous inspiration from the tight poems containing Schwenk’s explanations. Everything I am currently doing, by trying to understand concussions this sabbatical year comes down to Schwenk’s water analysis, his singular vision trying to fathom the meaning of, water in motion. Let me take some descriptive words from the back cover of Sensitive Chaos, strategically to give a brief, compact overview. So in attempting to come to terms with a brain in motion, you bring into the observation window the primal relevance of water as a extraordinary special element, ‘the blood of the Earth’, in Schwenk’s terms. Out of this amorphous water, shapes and layers of patterns emerge in the gravity motion of water moving. It is those water movements spiraling into design blueprints for the life forms within the vortexing water that captivated Cousteau during his night dive with his son Falco. Water is shapes in motion-water motion’s shape is the design blueprint for Nature.